I used 5 big apples (Jonagold) and 4 round plums. In total this was around 550g of apples and 250g of plums so I needed 800g of jam sugar. There are different kinds of sugar to make jam, however mine had to be used in a 1:1 ratio. If you want to you can use a sprinkle of lemon juice as well. Clean and cut the fruit into small pieces and together with the sugar give it in a large pan. In the beginning I thought this will never work and everything will burn. But in fact when you use a small flame, the sugar slowly melts into some sort of jelly and cooks the fruit soft. At this point I used a hand blender to make a smooth jam (or use a food mill if at hand). Let it come to a boil and let it cook for around 4-5 minutes. In the meantime make sure you have clean hot jam glasses ready to use. 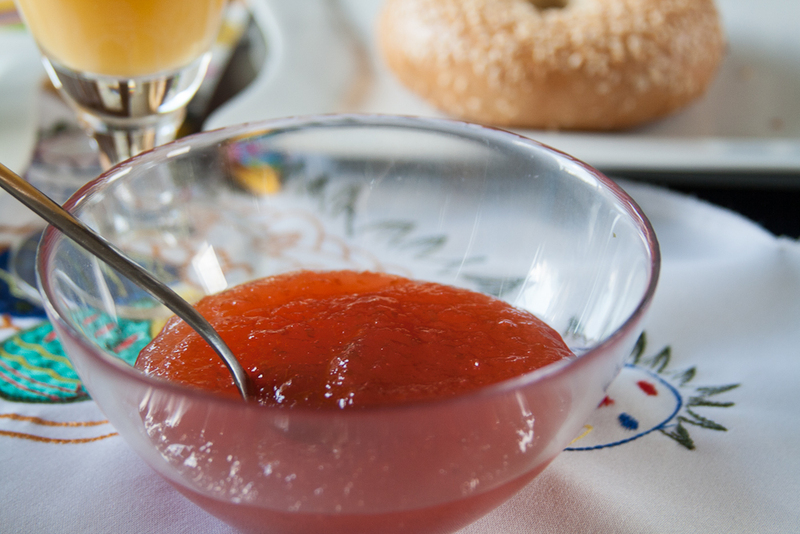 Once the jam has cooked for a couple of minutes immediately pour it into the glasses and put the lid on. Let it cool upside down for a couple of minutes first before letting it cool completely.